Actually, everything is tracked via documents – company budget, purchase requests, customer orders, etc. And today every document is an electronic document – it is created on a PC and stored as a file or as a record in a database. Paper-only documents are almost obsolete (thank God). It is a common scenario, when a document requires several people to take a look at it. Often, several departments are involved in work on the same document. For example – when an employee needs something for his work, they create a “Purchase Request” document. Depending on how your internal processes are designed, this document must be approved by the manager, by financial department, by CFO. After approval, it is sent to the appropriate person in the financial department for the payment to be made. And, finally, the requestor approves or rejects the goods/services he requested. And that’s a simple scenario – I’ve seen much more complicated workflows for the same scenario. 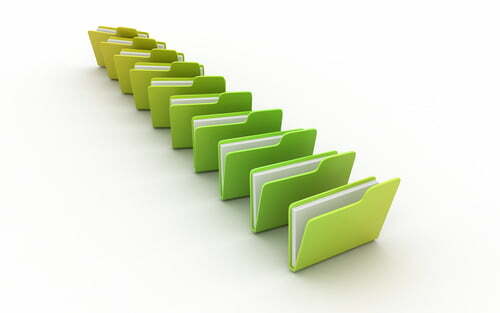 But regardless of the process complexity, accurate document control is a must. Now let’s imagine – what can happen, if instead of using special document management software, a “Purchase Request” is sent via email? Someone can just ignore that email or simply not receive it (maybe it will be put the “Spam” folder). OK – even if I have received this email, I can be so busy, that I can simply forget about it. Another possible scenario – I start receiving so many emails (purchase requests) everyday, that I will start spending half a day raking through these emails. And my life will become a nightmare. So the main problem in document management – to manage documents effectively, and to separate different process steps from each other. 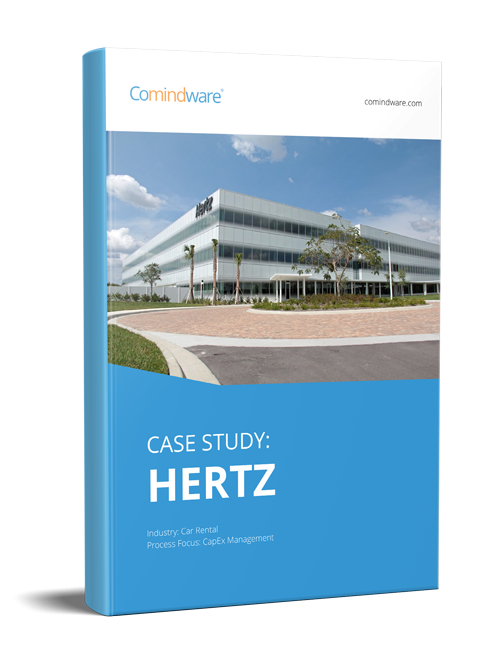 With Comindware Tracker, a system that combines both process and document management software capabilities, you can organize your document management in an efficient way. Open Comindware Workflow Editor and design your process right there. No special knowledge is needed – we offer a simple and intuitive graphical interface. Let’s continue with the “Purchase Request” example. Create several steps – “Verification by direct manager”, “Verification by CFO”, “Purchase order creation”, etc. Using the “Draw Transition” button, drag lines from one step to another. For some steps, set the responsible people – for example, open “Verification by CFO” step settings (by double clicking on it) and set the responsible person to your CFO. And that’s all – by these simple actions, you’ve just created a great solution for your company that meets all the requirements of an individual document management system. 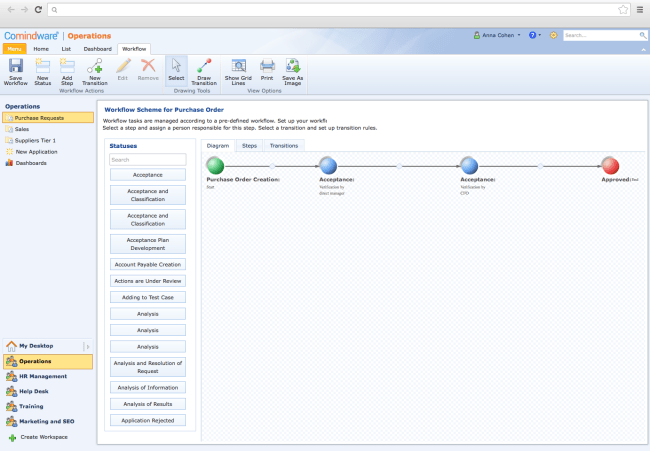 Now your employees can create their “Purchase requests” in the in-built document management system of Comindware Tracker. Each step has a responsible person, so no more “What should I do next?” questions. After finishing their job, the employee will simply press the “Next Step” button in the object form and the process will be readdressed to the next person. Your email box is now free of tons of unneeded emails, which you are not interested in – Comindware Tracker will only send notifications, which are related to you (besides, you can always adjust these settings). On top of that you can rest assured that “document control is in good hands”. And here’s another great thing – Comindware Tracker by default includes several perfectly predesigned workflows (including “Purchase Request”, of course). 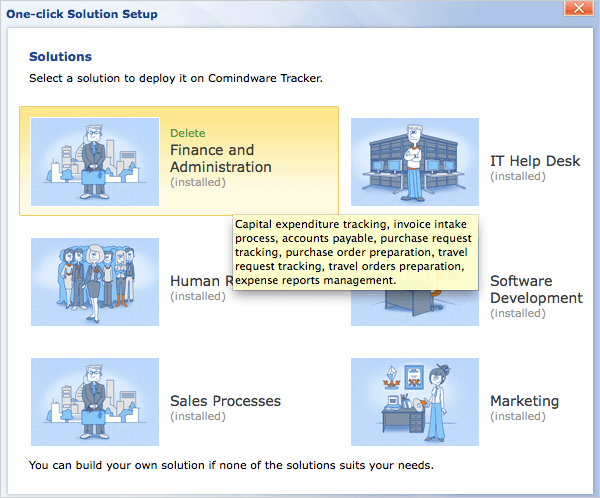 To install these solutions, go to the “Menu” tab in Comindware Tracker interface and click the “One-click solution setup” button. In dialog, select the solution you are interested in – “Finance and Administration”, “IT Help Desk”, “Human Resources”, “Software Development” or “Compliance and Policy Initiatives” and voila – you will get a complete solution (including predesigned workflows, applications and samples). To start in the Cloud, simply register here for your free 30-day trial keys.